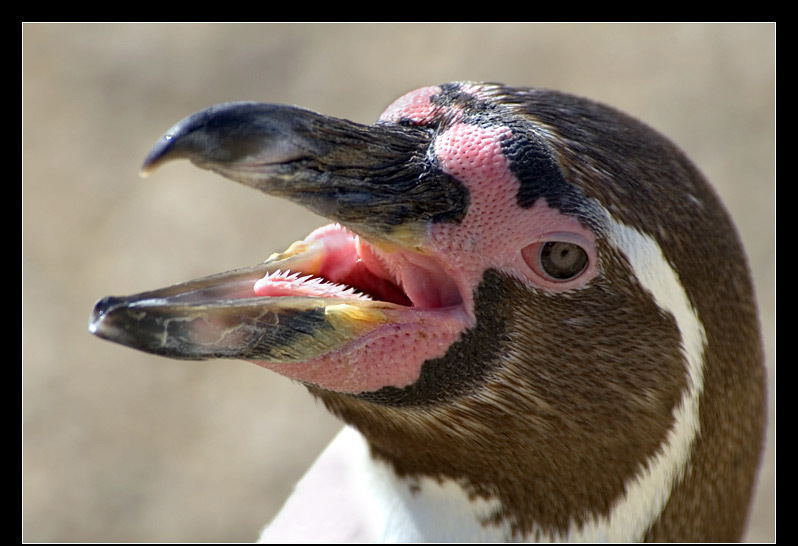 Birds (including penguins) are warm-blooded (also called endotherm or homeotherm) animals. "Some types of animals employ physiological mechanisms to maintain a constant body temperature, and two categories are commonly distinguished: the term "cold-blooded" is understood to refer to reptiles and invertebrates, and "warm-blooded" is generally applied to mammals and birds. These terms, however, are imprecise; the more accurate terms, ectotherm for cold-blooded and endotherm for warm-blooded, are more useful in describing the thermal capabilities of these animals. Ectotherms rely on external sources of heat to regulate their body temperatures, and endotherms	thermoregulate by generating heat internally. Endotherms maintain body temperature independently of the environment by the metabolic production of heat. They generate heat internally and control passive heat loss by varying the quality of their insulation or by repositioning themselves to alter their effective surface area (i.e., curling into a tight ball). If heat loss exceeds heat generation, metabolism increases to make up the loss. If heat generation exceeds the rate of loss, mechanisms to increase heat loss by evaporation occur. In either case, behavioural mechanisms can be employed to seek a more suitable thermal environment. To survive for a limited period in adverse conditions, endotherms may employ a combination of behavioural and physiological mechanisms. In cold weather, which requires an increase in energy consumption, the animal may enter a state of torpor in which its body temperature, metabolism, respiratory rate, and heart rate are depressed. Long-term winter hypothermia, or hibernation, is an extended state of torpor that some animals use as a response to cold conditions. Torpor and hibernation free the animals from energetically expensive maintenance of high body temperatures, saving energy when food is limited." "Body temperature depends upon a balance between heat production and heat loss. In human beings, an elaborate system maintains temperature within a narrow range despite wide variations in heat production or environmental temperature. Each organ in the body contributes to heat production. The brain and muscles produce about one-sixth of the body's heat, the viscera one-sixth, and the heart one-tenth. During exercise, heat production by muscle can increase markedly. Body heat may be lost through radiation, evaporation, convection, or conduction. In general, 60 percent of total heat loss occurs by radiation from the body's surface at a rate affected by the rate of blood flow to the skin's surface. Evaporation is the method of heat loss that can be regulated most readily; the sweat glands can dissipate as many as 1,700 kilocalories per hour. Insulation provided by fat and by intact skin acts to maintain normal body temperature when the body is exposed to cold or warm environments. The thermoregulatory region of the human brain is called the hypothalamus. Chemical substances called prostaglandins may serve as molecular transmitters of stimuli to the area of the hypothalamus concerned with temperature control. Elevation in the temperature of blood going to the hypothalamus is the most important factor in the central control of body temperature, initiating heat loss by causing dilation of blood vessels and increasing heat loss by sweating." Thermal insulation specifically for a penguin. 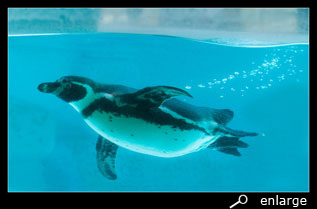 For a warm-blooded penguin the body temperature is about 39°C. Man and animal can regulate their body temperature by choosing an ambient temperature close to the body temperature. Moreover you can increase or decrease the heat production; increase by much activity or shivering. Thermal conduction is strongly affected by the exterior body-layers as fat and skin. 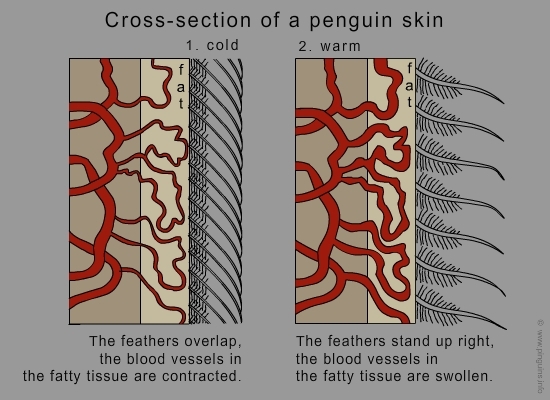 By in- or decreasing the blood supply and by arranging hair (or for penguins feathers), thermal insulation can be changed. As for penguins, thermal insulation is regulated by their feathers and fat under the skin. Their feathers are tightly packed (see body) and must regularly be maintained and oiled, to form a waterproof coat. The downy feathers form the waterproof "underwear", holding air between the skin and the environment as a first insulation. On land, a penguin can increase this insulation by setting up his feathers. On windless days the surface of a penguin is not warmer than the ambient temperature, so snow will remain there without melting. Instead of heat loss, the snow will screen from icy wind and avoid a too large heat-interval. 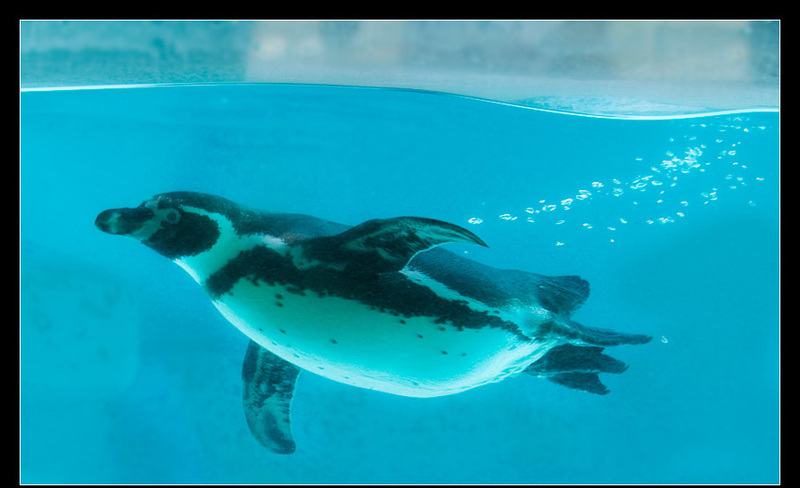 But this is not always enough, and therefore a penguin has to increase the heat production by strong movements with the flippers or shivering. During diving, the feathers are pressed together by the pressure of the water, narrowing the air layer. You can now see the typical air bubbles (bells) coming out of between the feathers. Now the fat and the skin have to take over the function for the thermal insulation. 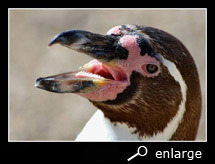 The skin for an emperor and an adelie penguin is 0,4 cm and the fat up to 2 cm thick. Moreover they are very active and fast in the water and their muscles produce enough heat to keep their body temperature steady. These heat is probably also used for warming up the caught food from 0°C to body temperature. 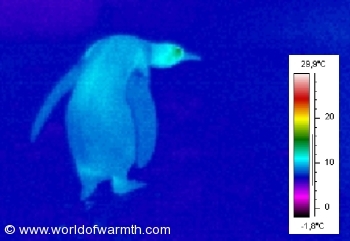 Body temperature of a penguin is not as constant as for a human being and can change till 3°C up or down. 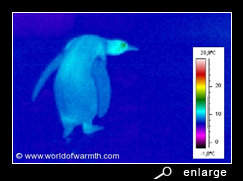 Iced water has a much larger (25 times more) thermal conduction as the Antarctic air, so that, with the same temperature, a penguin either can stay one minute in the water or rest 25 minutes on land. The heat loss in both cases is the same. Amazing is also that chinstrap penguins can rest in the water. How they do not freeze that way, is still unknown yet. As soon as penguins get out of the water, they start cleaning and combing their feathers. With their bill they go with uniform motions through their feathers and shuffle their head to remove the water. Their neck is so mobile they can reach almost every single place. After each motion they bring their bill to the preen gland, an double-sac organ as large as a pea, located on the back near the base of the tail, in which a waxy oil is found. "The secretions of the preen gland empty to the skin surface through one or more nipplelike pores. Most birds preen by rubbing their bill and head over the preen gland pore and then rubbing the accumulated oil over the feathers of the body and wings and the skin of the legs and feet. The oil is thought to help preserve the integrity of feather structure and, in some species, is also believed to be useful in preserving the horny structure of the bill and the scales of the legs and feet. It has also been speculated that, in at least some species, the oil contains a substance that is a precursor of vitamin D. This precursor substance is thought to be converted to vitamin D by the action of sunlight and then absorbed through the skin." This oil prevents dehydration and acts as insulation against the water. It also is a "dirt-antidote" and prevents mildews, bacteria or algae to clutch at the feathers. 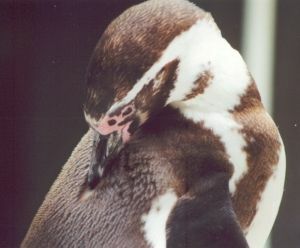 The air between the feathers and the skin isolate so much that a penguin could overheat in the sun. When they move fast through the colony and the sun burns on their black feathers, the heat can't be lost fast enough. You can see them spreading their wings to increase the body surface. Some species even pump blood through their wings, and then you can notice a pink surface on the inside. This is almost the only part of the body which isn't covered with feathers, therefore almost the only way to lose heat surplus. When this still isn't enough, they will pant like a dog and lose heat through a moist mucous membrane. 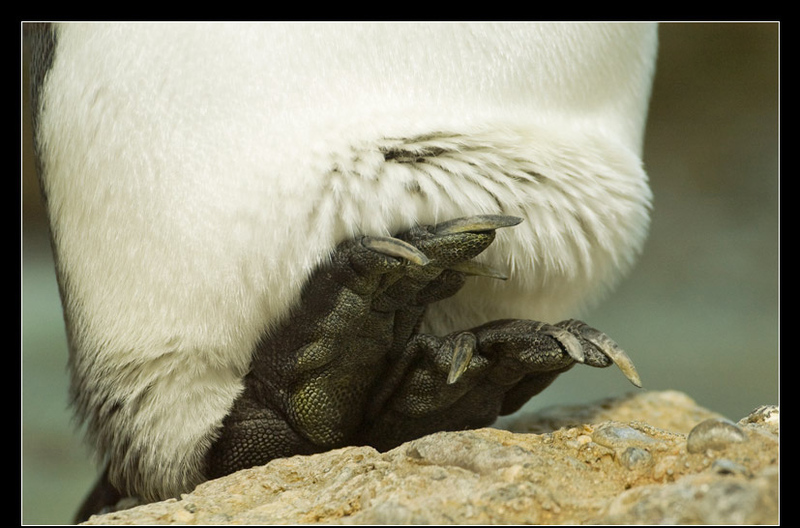 You can ask why a penguin doesn't get icebound with his feet? By cold, on the other hand, feet and wings have just a little blood flowing through them and the temperature is only a few degrees above 0°C, causing just a very small heat loss. 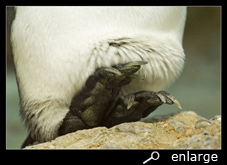 Emperor and king penguins also have such a small loss because their feet only touch the ground by the heels. The feet point to the air, decreasing the contact to a minimum. This is prevented by an ingenious system of the blood circulation in the legs. The warm, oxygenated blood, that is pumped to the feet, is partly cooled off by the returning, cold, oxygen-poor blood. The veins for the returning cold bloodstream lay around the artery, which leads the warm blood to the feet. In that way warm blood is cooled off, and cold blood warmed up in the legs. Therefore penguins have a very small heat loss in their feet and can't freeze on to the ground. In Antarctica, a penguin breeds by temperatures from -40 °C and bears snowstorms till 130 km pro hour. A female emperor penguin lays one single egg and passes it to the male partner. This is not so simple, considering the fact that such egg is not round but conical, because it should not roll away and moreover should not touch the ice either while freezing otherwise. Afterwards, the female leaves, together with a lot of other females, the colony to walk 100 or more kilometres, looking for a hole in the ice, where they can enter the water to eat. It will take two months before the egg hatch and the females return with food. All that time the male must breed on the egg, without food. Herewith he loses a third of his weight, especially fat and muscle tissue, transformed to energy, to maintain his body temperature.